This morning we headed into KL by bus (about a 90 minute ride) as we will be performing at a Youth Conference here this weekend and attending the Passion ’08 Concert on Sunday night. In addition to the normal team, we have been fortunate enough to have Job come with us on this trip… Job is a 17 year old high school senior who attends the same church we do. Candidly, the kid is amazing! He serves as our bassist in the band, but also plays guitar and piano and is the sound technician for all the church services. Did I mention he gets straight A’s? Anyhow, as he is a local, he served as our tour guide all day. As with any metropolitan city, KL has lots of traffic and lots of big buildings, including 32 monster malls. In hind site, I feel like all I’ve seen in KL is malls, malls, and more malls. Our KL host Rodney picked us up at the bus station and took us to our hotel, which was conveniently located next to the Sunway Convention Center (which is a fancy name for a gigantic mall). Straight away, we went to Tony Romas for lunch. As I hadn’t eaten (nor desired) any real American food for the past seven weeks, I was pretty stoked about a burger. The food was great, but I received quite a shock when I experienced “American Portions” again… There really is no surprise to hear that the U.S. is the most obese nation in the world. Just thinking about the portions makes me a little quezy. Do we really need “fries with that?” Isn’t a 600 calorie burger and a 300 calorie soda enough for lunch? 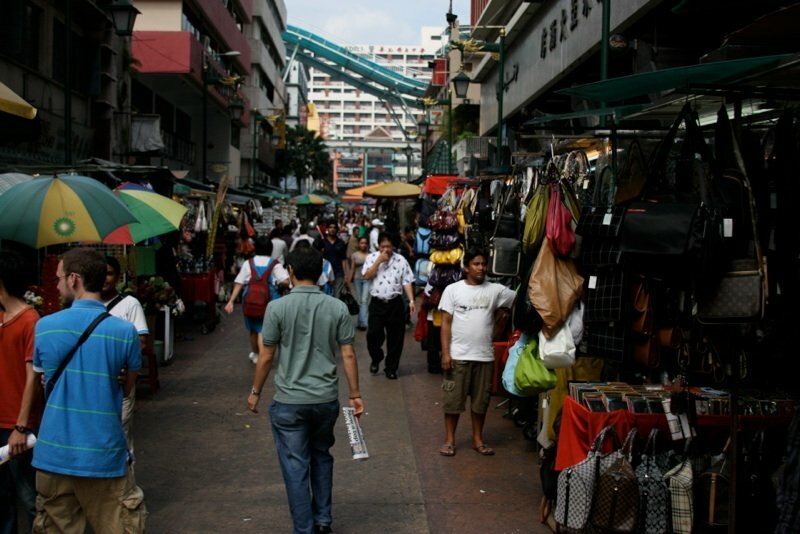 I really hope to adjust my eating habits on return to the U.S.
After lunch, we headed downtown to the Petaling Street Market (pictured above) where I picked up a Malaysian soccer jersey as my souvenir. In the evening, we returned to the hotel, I took a cold shower (seriously, no hot water in all of Malaysia? ), and hit the sheets.